Contains links to external sites, CloserToKOL is not responsible for their content. After much thought, I've decided to no longer continue posting on CloserToKOL. Over the last few months, it has been increasingly difficult to find adequate time to run the website and give it the attention to detail it deserves. I have enjoyed the experience of creating and running CloserToKOL immensely over the last several years and have met many wonderful people during this time. The website would not have been as successful without the help and contributions of many fans over the years, especially those who allowed me to publish their photos, videos, experiences etc. Also, having Revolver Films allowing me exclusive access during the promotion of Talihina Sky was invaluable. 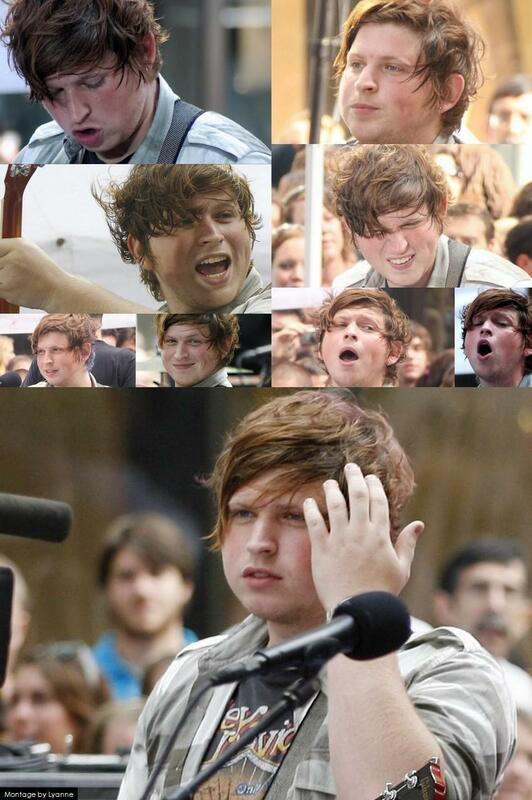 I am, of course, still a huge Kings of Leon fan - always will be. I think taking a step back will allow me to enjoy being a fan again without the added pressure of publishing all the information – so from a selfish point of view, I’m quite looking forward to that. I will leave this site "live" for the foreseeable future, so please feel free to still visit to watch your favourite videos, look at the extensive photo galleries, listen to live music or even use it as a "KOL Encyclopaedia" for past tour dates etc. I will also leave the CloserToKOL Facebook open to enable anyone who may have a news story, tour info, new photos/videos etc to post the links on the Facebook Wall. This way, it can be used as a "Bulletin Board" and will hopefully keep everyone up-to-date with what’s going on in the world of Kings of Leon! There are still a few T-Shirts left in the Sale and once these have sold out, the T-Shirt Store will be removed from the website, so if you want one, order it now! Once again, my heartfelt thanks go out to everyone who has joined this website, followed me on Twitter and Tumblr or friended me on Facebook over the years and for your many contributions and lovely comments you have sent me that has made all the hard work worthwhile. Hopefully I will bump into some of you at future shows! Kings of Leon T-Shirt Sale Now On! Happy New Year Everyone! 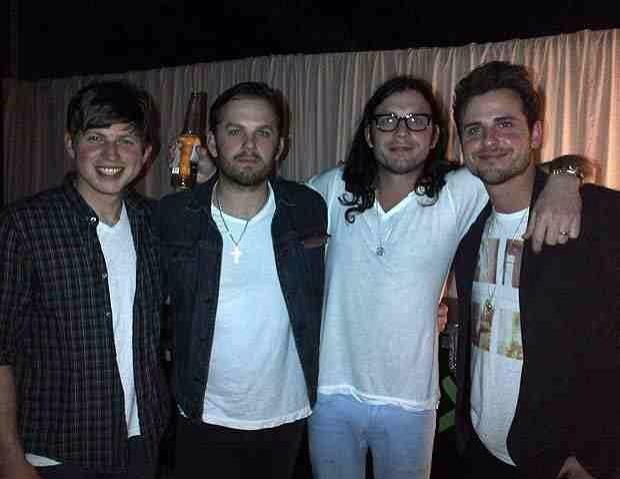 Lots of Kings of Leon shows & a new album to look forward to in 2013...Should be a Good Year! The band spent New Year's Eve performing at Russian billionaire, Roman Abramovich's Private Party on Caribbean isle of St Barts. Photo from The Sun's article about the Party. Congratualtions to Nathan & Jessie on the Birth of their Daughter VIOLET MARLOWE! Little Violet was born on Wednesday (December 26th) at 4:01pm in Nashville, Tenn. and weighed 7 pounds and 13 ounces. Looks like PersonalFest will be livestreamed on YouTube this weekend. Watch the video of Jared on stage with amoungs others, Johnny Depp! Tickets go on-sale 10am on Friday 9th November and are available from LiveNation.co.uk, Ticketmaster.co.uk or GigsandTours.com. Shows seem to be getting confirmed ever other day! There will be a Livestream of the Sao Paulo Show on 20 Oct for Latin America, The USA and Spain. It will be available from this website. Kings of Leon are due to play around 9pm local time. You can find the current time in Sao Paulo by looking at the bottom right on this page. WATCH THE ENTIRE SET HERE! 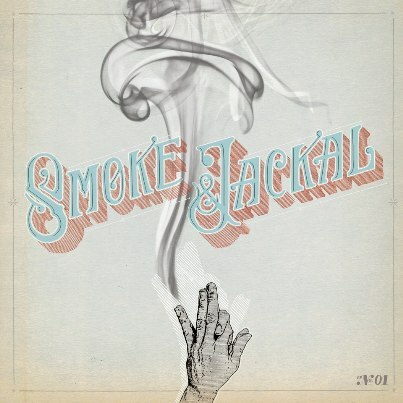 Jared & Nick called into BBC Radio One's Zane Lowe Show to promoting Smoke & Jackal and the release of "EP 1", which you can listen to & buy from here). 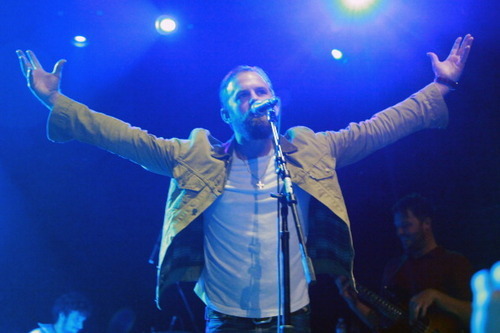 Jared mentioned a "couple of shows on the horizon"
Kings of Leon returned to the stage for the first time in almost a year last night to perform at the Oracle Open World Event at Treasure Island, San Francisco. 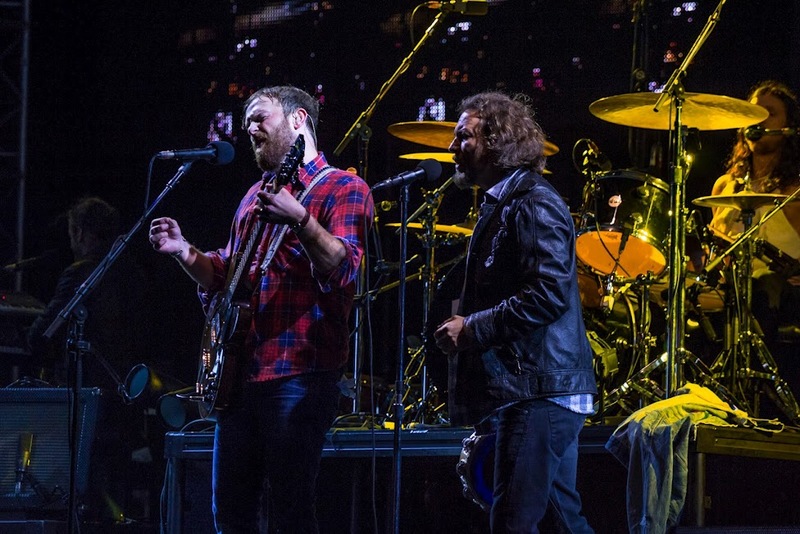 They were supporting Pearl Jam and Eddie Vedder joined them onstage for "The Bucket", (watch the video) which was a surprise, as he normally sings "Slow Night So Long" with them! Another highlight was "Arizona" in the setlist. Click HERE to see some photos from the concert. Congratulations to Jared and Martha! Jared and Martha tied the knot in a private ceremony on Saturday (September 29) at Front Porch Farms in Charlotte, Tenn. The couple exchanged vows in an intimate ceremony with family and close friends in attendance. They said “I do” at approximately 5:55p.m. "Marrying my best friend today. I'm the luckiest girl in the world," Martha tweeted. Jared also shared his own, "Today, I get married. It's the biggest step I've ever taken. I've dreamed about this day since I was a little girl." He proposed to Martha in April after dating for only a few months with a four-carat cushion cut diamond ring, which he designed himself. The reception featured a beautiful firework display and a five-tier strawberry cream cake, sources tell JustJared.com. The couple worked with event planner Sharon Sacks, who helped plan Caleb and Lily's wedding last year. The groom sat next to his BFF, entrepreneur Douglas Chabbott, and Mona frontman Nick Brown. The bride and her mother danced to the Carrie Underwood song “Mama’s Song” during the evening. One of the highlights of the reception was when guests danced to the “Copperhead Road” line dance. The wedding picked a rustic theme with the bride and groom wearing Lucchese boots during the ceremony. Friends and family including the rest of Kings of Leon stayed around for a celebration at the rustic Front Porch Farms after the ceremony. "They had a great farm-to-table cuisine with all of their favorite things. It was down home and very real. It was very much true to their style," a source told People mag. Some of the featured drinks of the evening were “The Firefly,” which was made with sweet tea, vodka, and fresh lemonade, and the “Champagne Cocktail,” with sweet cube and aromatic bitters. Each guest took home a jar full of freshly baked chocolate chip cookies. The bassist appears to have found his perfect mate in Patterson. Last year, Jared spoke to PEOPLE about the pressure he feels from his brothers to find the perfect girl to marry. "I know it's stupid," he said, "but you feel pressure in the sense that people are judging you. It goes into your decision-making, like, 'What are my brothers going to think?' I'm not talking about looks obviously, even status, you just have to find somebody that people like because everyone has settled down." Jared tweeted a photo of them after the wedding. The 21-year-old bride was wearing a Monique Lhullier gown while the groom and his groomsmen went with Gucci suits. "Aaaaaand I'm married. Happiest man in the world." It's Martha & Jared's Wedding Day! It was a proud day today for Kings of Leon, their family, friends and fans as they were inducted into Nashville's Walk of Fame and also received Nashville's "Music City Ambassador Award". All band members were in attendance and you can watch Nathan's speech by clicking on the link at the bottom. Also click on the links below to see lots of photos of the band, their family and friends attending the ceremony. Photo by Lily Aldridge who tweeted: "So proud of my husband"
Middle Tennessee fans can celebrate a crowning achievement for Kings of Leon on September 21, when the Nashville rock band will be inducted into the Music City Walk of Fame. KOL will receive the 61st star in the pavement of Walk of Fame Park in downtown Nashville, joining the likes of Hank Williams, Dolly Parton and Jimi Hendrix. The Music City Walk of Fame was established in 2005 by Music City, Inc. - the charitable foundation of the Nashville Convention & Visitors Bureau - to honor influential musical figures with a strong connection to Nashville. In a release, Nashville CVB president and CEO Butch Spyridon said the band was an ideal fit for the Walk of Fame. The induction ceremony is free and open to public, and takes place at 1 p.m. on Friday, September 21 at Walk of Fame Park (Demonbreun, between 4th and 5th Ave S.). We arrived in Nashville on Saturday after a very bumpy plane ride over the pond and then an even bumpier plane ride from Philadelphia to here! This was due to the severe storms affecting NYC. First thing I noticed at the airport was that you had famous musicians welcoming you to the city over the PA system and asking you to check the tags on your luggage etc - Lionel Richie being just one of them! On Sunday, we met up with Carrie, who lives here and I've known for over 3 years, but this was the first time actutally meeting her and it was amazing!. She was our guide and showed us round the beautiful city. We stopped for lunch at Burger Up, which was really good - we got there just in time as the power blew right after we were served our delicious food! Right next door to Burger Up is Las Paletas (Paletas are Mexican popsicles/ice lollies that come in creamy or fruity flavours) - they are to die for and make you want to try one in every flavour! On Monday we visited the Belle Meade Plantation which was beautiful and is famous for breading thoroughbred horses. While there, you can do wine tasting as they have their own winery, now, I don't like wine, but every wine we tasted was so good that we ended up buying some bottles as well as a Southern Country Cookbook! In the evening we ventured Downtown to see some live music and ended up in The Stage on Broadway - this was the busiest bar with the best live music. It is also where parts of the film Country Strong were filmed - sadly, Gwyneth Paltrow, Tim McGraw, Garrett Hedlund, and Leighton Meester were not there to share a beer with us! 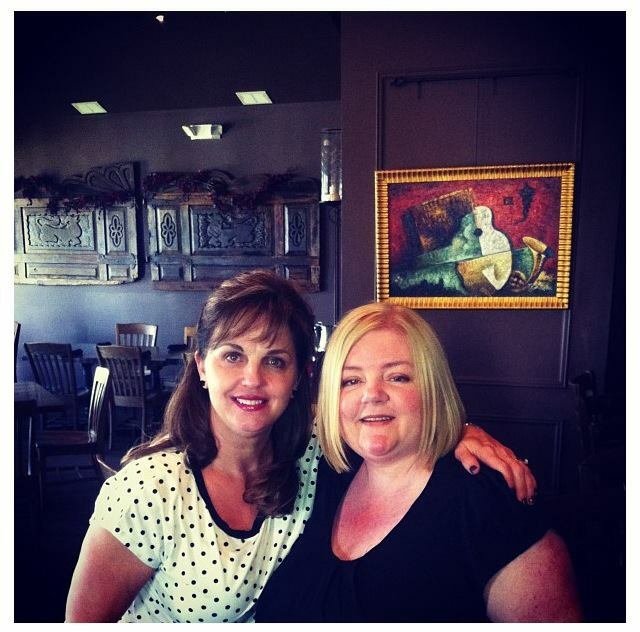 Yesterday I had lunch with BettyAnn (Nathan, Caleb & Jared's Mum). When she found out I was in town, she asked to take me to lunch. We went to a little quaint restaurant and, as we say in Scotland, had a good old chin-wag! She was really lovely and it was so nice of her to take time away from her work to take me to lunch. Today, we started with breakfast at The Loveless Cafe which has the best biscuits and preserves I've ever tasted. Then it was off to The Hermitage, home of President Andrew Jackson (America's 7th President). Beautiful house and grounds (to walk off breakfast! ), not so sure about his political views though! It's hot hot hot here, today it was 95F - a bit too hot for a light-blue Scottish person! Later in the week, amongst other things, we plan to visit the Ryman Theatre, home of the Grand Ole Opry broadcasts from 1943 until 1974. 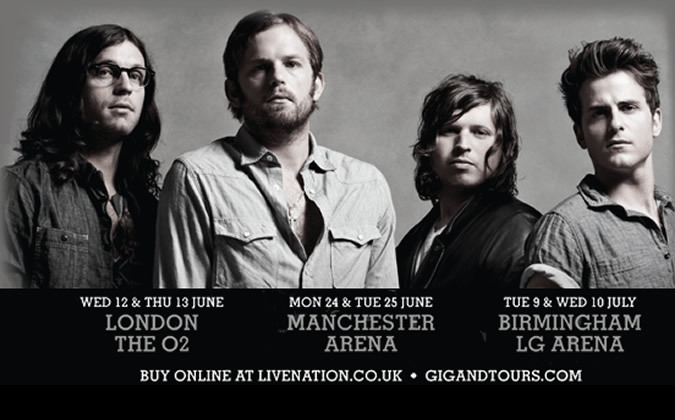 Kings of Leon have also played there in 2005 & 2007 - there is footage of them playing the Ryman on Talihina Sky. But, tomorrow we are off to see the original King... Graceland, watch out, the Scots are coming! Recording of Album #6 Starts very soon!